Malaysia’s Mahathir Mohamad has returned to power as prime minister, becoming the world’s oldest elected leader. Mahathir is 92 years old. He previously ruled Malaysia for 22 years. He led a group of opposition parties that won a parliamentary election on Wednesday. Official results showed the opposition parties – called the Alliance of Hope – received more than the 112 seats required to win a majority in parliament. 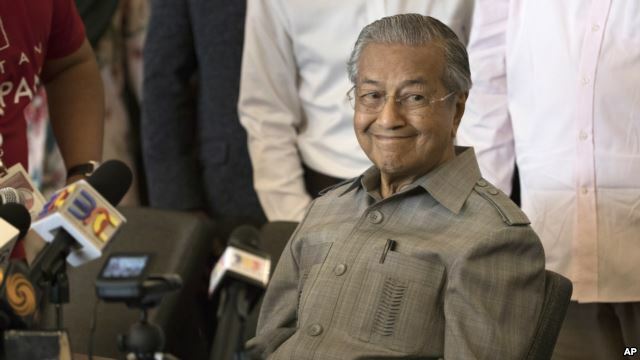 Mahathir was sworn in Thursday by Malaysia’s king, Sultan Muhammad V.
The election ended 60 years of rule by the National Front coalition. The party had led Malaysia since it became independent from Britain in 1957. The National Front’s loss came after Najib became involved in a major corruption scandal. He also faced political problems for supporting new taxes that greatly affected poor Malaysians. Mahathir told reporters he was ready to carry out major changes for Malaysia. He promised to cancel the unpopular goods and service tax approved in 2015. He said the government could also renegotiate terms of Chinese loans for infrastructure projects. Mahathir ruled Malaysia from 1981 to 2003. He is credited with building a strong and lasting economy. But he was also known for taking some actions seen as undemocratic. These included silencing and imprisoning political opponents and influencing the country’s courts. Mahathir said his government would not seek “revenge” against political opponents. However, he said officials would seek to bring back the rule of law and prosecute those who break it. Bryan Lynn wrote this story for VOA Learning English, based on reports from the Associated Press, Reuters and Agence France-Presse. Ashley Thompson was the editor.